A Rare 6.8 Magnitude Earthquake Struck India (updated Sept. 19th with Damage Reports). | Chaos Sweeps Away the World We Know! The Disaster, current events & Catastrophe Blog. Forecasts for 2014 to 2022. Read tomorrows news today! Plus current economic, commodities, stock indices and financial news. ← A 6.2 Magnitude Quake Hits Japan, Less Than Two Hours After the Last One. A Rare 6.8 Magnitude Earthquake Struck India (updated Sept. 19th with Damage Reports). 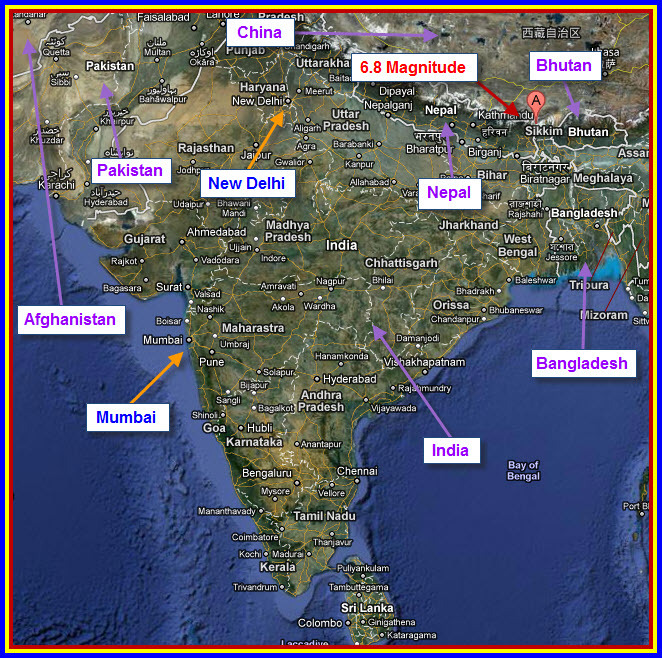 September 19, 2011 – A Rare 6.8 Earthquake Struck India: Echoing the chaos west of the epicenter, in Afghanistan and Pakistan, a rare 6.8M EQ struck India on Sunday. At a relatively shallow 20 kilometers (12 miles) there was wide-spread damage and deaths, including landslides. rescue teams begin to access the more remote areas,” said G. Anandan, chief of the central emergency control room in Gangtok. Tremors were felt more than 1,000 kilometers (621 miles) away in New Delhi to the west and in Bangladesh to the east. In Nepal, police said a motorcyclist and his eight-year-old daughter were among three killed when a wall crumbled at the British embassy compound in Kathmandu, 270 kilometers (168 miles) west of the epicentre. The quake was 43 miles north-west of Gangtok, Sikkim, India; 74 miles NNW of Shiliguri, West Bengal, India; 83 miles east of Namche Bawzar, Nepal; and 103 miles west of Thimphu, Bhutan (see map). The tremor hit at 6:11PM at the epicenter; 8:41AM in NY, 7:41AM in Chicago, 6:41AM in Denver and 6:41AM in LA. This entry was posted in Earthquake, Events, India, Misc, Miscellaneous, Nature, News and tagged 5000 army troops help in india earthquake, 6.8 sikki india earthquake, bhutan, damage reports on india earthquake, deaths from india earthquake, gangtok india, helicopters assist in india earthquake rescues, indeia earthquake teams stuck, india earthquake, india earthquake september 18 2011, mudslides from india earthquake, namche bawzar nepal, namche nepal, nepal, september 18 2011 earthquake, shiliguri india, sikkim india, the master of disaster tremor september 18 2011, thimphu bhutan, west bengal india, west engal. Bookmark the permalink.